A simple statement from British author John Baker that discloses the birth of an obsession. 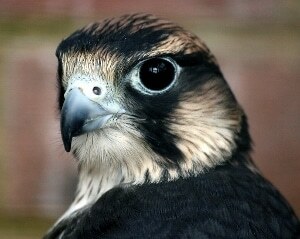 Baker would spend the next couple decades of his life pursuing peregrine falcons along the coastline east of his hometown of Chelmsford, England. Riding his bicycle to the shore near his home, he developed a knack for finding the birds each winter along the eastern English coast. In the early 1960s he spent much of his time, in weather both fine and foul, tracking the birds as they hunted in the farms, salt marshes, mudflats and beaches of eastern Essex County. Baker tells of one remarkable winter in The Peregrine. Famous for their incredible aerial hunting abilities, often reaching speeds of over 200 miles per hour when descending in a stoop, peregrines strike terror in the hearts of local bird populations. Able to dispatch birds considerably larger than themselves, peregrines take advantage of the large migratory flocks that pass through England’s coastal wetlands during the winter. Shore birds, wild pigeons, gulls and ducks are all favorite prey species and Baker documents the carnage in exquisite detail, highlighting the predator’s amazing skills and their prey’s often hapless evasive efforts. A peregrine, seeking out its next unfortunate victim. Presenting each day as an individual vignette, spanning from October to April, Baker describes the natural world with a remarkable attention to detail. He excels both as an astute observer and a literary artist, capturing the tenacious spirit of the falcons as well as the somber beauty of the winter landscape. His writing, particularly his use of color, reminds me of Monet’s water lily and garden paintings. Each daily entry is simply one more episode of peregrines terrorizing the avian neighborhood, but the light and weather – even the birds’ moods – are different every day, resulting in an exquisite collection of natural literary landscapes. Taken as a whole, the pieces combine to create an emotionally powerful document about of one of the most amazing creatures on the planet. When the book was published in 1967, peregrine populations were in free fall in England and worldwide due to pesticide use. As far as Baker could tell at the time, he was writing the species epitaph, a situation that adds additional passion to his work. Fortunately, peregrines are no longer in danger of extinction and they presently can be found pursuing more than a thousand different bird species on all six temperate continents. 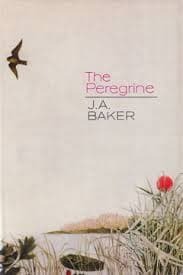 An example of nature writing at its finest, deftly combining striking artistic imagery with uncompromising scientific inquiry, The Peregrine was awarded Duff Cooper Prize in 1967. It’s a work that continues to elicit high praise to this day and is well worthy of it. Highly recommended for anyone fascinated by one of nature’s preeminent predators.